Only the FONAR UPRIGHT® Multi-Position™ MRI can scan patients in the positions in which they experience problems —sitting, standing, bending, leaning, as well as lying down. All other MRIs can only scan patients lying down. The UPRIGHT® MRI enables the patient to place himself in the position that generates the pain so that images can be acquired in that very position. Correctly identifying the pain-generating pathology can markedly improve patient surgical outcomes. 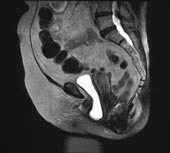 In addition, it enables the surgeon to see all the pathology he has to address, not just the single-position, non-weight-bearing image provided by the conventional MRI. This enables the surgeon to see the full extent to which the disk herniation increases when the patient flexes or extends, or the extent to which the patient's vertebra is sliding back and forth with body position. The UPRIGHT® MRI allows all parts of the body to be imaged with the normal weight of the body on the spine and other joints—an advantage that can lead to a more accurate diagnosis. Imaging the spine when it is fully loaded with the weight of the body, as compared to unloaded in a conventional lie–down MRI, is critical to an accurate diagnosis. As you can see from case studies, the source of back problems can be “missed” when the spine is not bearing the weight of the body and not imaged in the positions the spine normally occupies. There are a growing number of patients who are sustaining dislocations of the cervical spine from automobile collision whiplash injuries of the head and neck. The UPRIGHT® MRI is needed to assess the extent to which the brain has been dislocated [descent of the tonsils of the cerebellum] into the opening in the bottom of the skull (foramen magnum). This critical assessment of the extent of brain herniation into the opening at the base of the skull (cerebellar tonsil ectopia, or CTE) can only be determined with the patient in the upright position so that the surgical repair of this herniation and the patient's "drop attacks" can be eliminated. Some patients are unable to lie down for an MRI exam, including kyphotic patients or hospitalized patients with congestive heart failure. In the absence of UPRIGHT® MRI, these patients would be unable to receive the MRI examinations they need. 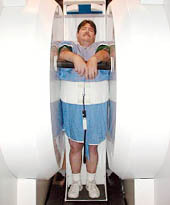 The UPRIGHT® MRI routinely accommodates large patients, many who simply did not fit into any other MRI. Our patient bed can handle patients weighing up to 500 pounds. Women patients, as a result of the inherent trauma of childbirth to their pelvic floor anatomy, will commonly suffer the consequences of PFD later in life. The symptoms of PFD are cystic prolapsed ("falling urinary bladder") and its chronic cystitis symptoms of urinary frequency, burning on urination, fever, and if unaddressed, chronic kidney inflammation (pyelonephritis). The patient must be upright to see it. It commonly returns to its normal position when the patient is recumbent and therefore is not diagnosed by the patient's physician who examines her in the recumbent position. It affects 10 million women. The UPRIGHT® MRI readily visualizes the fallen bladder when these patients are upright, so that the surgeon has full image visualization of the anatomy that has to be repaired.